the WRITE Balance: How Useful is Your Library? I'm the queen of not utilizing things mostly because I'm not in the habit. Sure it might be life changing, but if I haven't purposefully pushed it into my schedule or lifestyle, it might as well not exist to me. The library is one of those things for a lot of people. 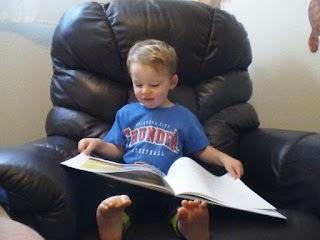 Loves to read, just like his daddy! They do what they see! I have always been a reader, but like I said, going to the library was an extra step that I didn't always take advantage of. Once I met Mr. Butler, who consumes words on a page like water, I was hooked, if only by association! We are blessed to live seconds from a recently renovated, very awesome library which is part of a huge library system here in Oklahoma City. So it's easy for us. Some of you might not be so blessed and of course all libraries don't offer the same services. If yours doesn't offer something, ask why not or what it would take to get it. You'd be surprised at how far you can get just by asking. Still, here are some really cool things about Oklahoma City's Metropolitan Library System. -Internet Reserves: Doing a research project? Found out your gluten intolerant? Think your husband's cheating on you? You can look up every book on the subject available in their system and request it to be reserved for you. -Online Renewals: If you want to keep a book as long as they will let you (about 2 months, depending), just renew your books online. No need to even show up. -Interlibrary Loan: As a card carrier, you have access to ALL libraries in the system. That means if your local branch doesn't have a book, the other 17 might! Use their website to find a copy and have it sent to your library for borrowing! -Books by Mail: If you are homebound, you can qualify to have library books sent to you by mail for free! -Free Events: There are free events (performances, club meetings, seminars, etc.) scheduled every week throughout the branches. All are very relevant to families, developing child readers, community opportunities, etc. Awesome, awesome, awesome. -Databases: Newspapers, almanacs, phone directories, encyclopedias, the list goes on of all the different kinds of information available and available online! Research (that isn't just internet 'knowledge') at the tip of your fingers 24-7. -Free Wi-fi & eMedia: Free Wifi and computer access - score! A whole host of books are available for loan on your ereader as well as audiobooks galore! And yes, I could go on. But here's the deal: If anybody in your family is in school (public or home) or ever needs to do research of ANY kind, why aren't you using your local library? It's an awesome resource that you're paying for anyway (taxes) whether you utilize it or not, so why not?